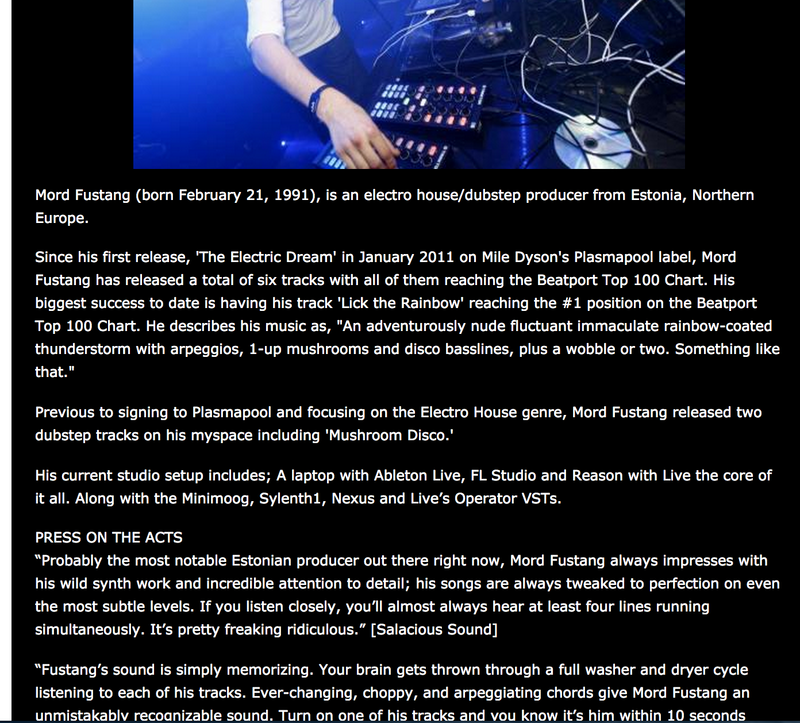 In [this article](http://skywaytheater.com/event/mord%20fustang), it states that Mord Fustang's studio setup includes the Moog Minimoog. At 10:16 they talk about their Minimoog. "We were bringing out some of these old synths that we hadn’t used — the Minimoog and the Yamaha CS-40. We’ve always used the Roland Jupiter-6; it’s pretty much a workhorse. It was getting back into that world." 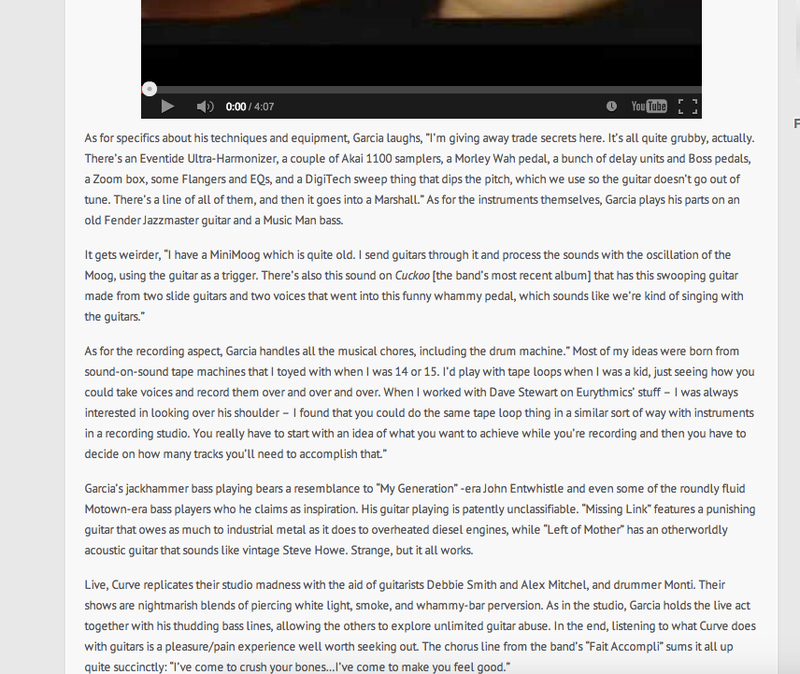 "At home I've got a basic setup of demos. I've got (Hybrid Arts) ADAM machines for the recording, and I program on (Steinberg) Cubase. I use an Akai CD3000, a (Roland) JD-800, and a (Clavia) Nord Lead. The Nord is a very interesting synthesizer -- the fact that you can record all your movements real time into computer, wave sweeps and everthing. I like it. I've also got three ARP 2600's and two Minimoogs. But I tend to keep things very basic at that stage." "when that little Minimoog came in, and it was not even vary loud, all the ceiling tiles began rattling and I was very happy!" The item can be seen 1:14 into this video. The Minimoog is the focus of Sebjak's Instagram photo, simply captioned "#moogme"
"That's the most famous synth of all time, I think. People who don't even make music sometimes recognize this. It's been on every album, ever. This is from my buddy. I got this from him a year ago and just fell in love with it. It's on permanent loan. ", said Tycho in [this interview](http://www.wired.com/2011/11/tycho-synthesizers/#slideid-539775) with Wired. In [another interview](http://www.soundtoys.com/tycho/), when asked, "Is there one piece of gear or an instrument that is the key part of that sound or has the largest impact on that sound?" > "It’s a 1972 Model D, and for whatever reason I just feel completely connected to that thing. It’s so responsive. It’s the closest thing I’ve ever found to a guitar in a synthesizer. For whatever reason when I sit down and play those, things just flow. With a lot of the newer stuff it’s harder just because for whatever reason it takes longer to get into a space where I feel inspired by the sound." At the 2.26 mark you can watch the Model D being used in the atached video. Oliver Heldens shared this Moog Minimoog Analog Synthesizer from his Facebook account. "I suppose it does sound synthy, yes, a pure, soft sort of middle frequency sound. It was one of the most important sounds in those earlier albums. It was the sound I kept working with and returning to... I never had a Minimoog at that time, I didn't get a Minimoog until about...1976." Minimoog can be seen in picture of Jon Lord on this tweet from JonLord.org. "So if I have a melody line, I have two Minimoogs I'll address MIDI to then record simultaneously on stereo files. The Minimoogs sound wonderful. They're just the kind of 'out of tune' you want them to be. My trick is to then make a sample instrument from the stereo files. I usually record about 60 notes from the Minimoog and use the original Minimoog at the same time as the sampled one, which opens up a richness of sound. The melodic line on the track Nachtfahrt [taken from Off The Record] is four Minimoogs playing. They're MIDI'd and also the first oscillator is tuned." "Over the last 40 years, some of the world’s most influential artists like Trent Reznor, Gary Numan, Dr. Dre, Keith Emerson and Herbie Hancock have shaped their unique sounds and forged new musical genres using the Minimoog Model D."
Richard Wright with his model D on stage (behind him) , during "The Dark Side of the Moon" tour . A few yeras ago our choices were limited to basically running stuff through the filter input of the Minimoog or putting it into the Eventide H3000. "Opposite the left-hand mirrored wall are the two isolation booths, one of which contains Flood and Alan’s collection of vintage analogue synthesizers, including the Roland System 700 modular, EMS VCS3 and Moog Minimoog." 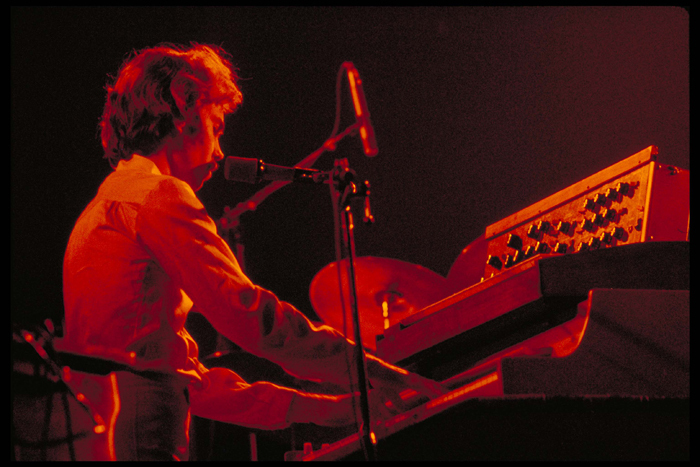 At :29 of this live performance of "Into the Lens" by Yes, Downes can be seen with a pair of Minimoogs to his right. In this video at 1:32, Para One of [L'Atelier](http://equipboard.com/band/l-atelier) and [TTC](http://equipboard.com/band/ttc) shows his studio, including a Moog Minimoog, for the process of making his second album 'Passion'. Towards the middle of this page, there is a photo of Lake with a Moog Minimoog Model D sitting atop his Mellotron M400. 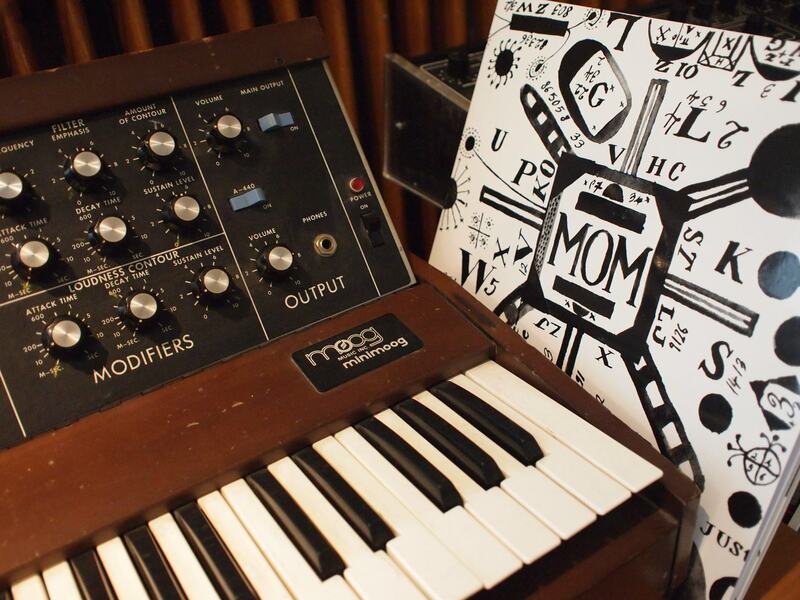 "We rented a rehearsal hall from Roger and this brand new Mini-Moog was sitting in the room. We started messing with it and got a sound we wanted for “Being Kind.” You couldn’t store presets, so we taped all the knobs in place and took it to Nashville. We joke about it whenever we run into Head East. At least we brought it back. By the time we did “Ridin’,” I had my own. " Visible from 4:04 in the video. 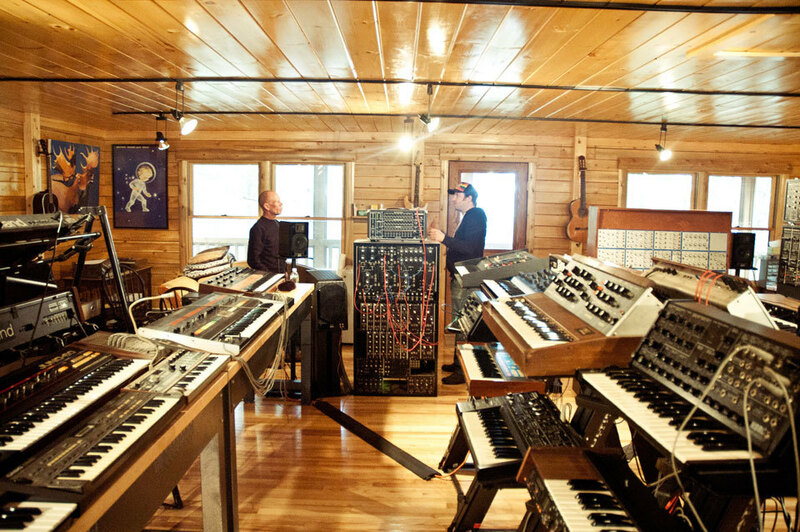 The Moog Minimoog can be seen just above the Korg MS-20 in the right foreground of this photo from Vince Clarke's studio. The synth basses on “Thriller,” “P.Y.T.,” and “Wanna Be Startin’ Somethin’.” Those were my two Richie Walbourn-modified Minimoogs, set side by side, with engineer Bruce Swedien’s special multiple-mono compression. Check minute 14:15 of the video. Kid Koala seen using a Moog Minimoog Model D in his studio in a picture posted on his official Facebook. Mike WiLL in the studio with Pharrel Williams, working on RANSOM 2. Moog Minimoog can be seen in the foreground. In the interview they ask "What specifically are your favorite pieces of gear? What can''t you live without in the studio?" To which Mark responds "Moog Minimoog, Yamaha DX-100, a spring reverb, Echoplex Tape Echo, EMS Synthi A, Universal Audio Precision Maximizer, ARP Odyssey and a Waterphone. I probably have used the Minimoog on more tracks that any other synth that I own." In this video Shook plays a short improvisation on the Minimoog Model D.
Tom Rowlands, of Chemical Brothers fame, working in his studio. Just check out the complete list of this synthesizer nerd … an instant daydream … and also explains the original sounds on their records! The Model D can be seen in his studio at the end of the video. Can be seen in the video for example on 6:25. Manfred Mann can be seen playing a Moog Minimoog Model D in this photo. In [this article](http://www.platform-end.co.uk/html/moogs.html), The Many Moogs of Manfred (Sounds - UK Article 1975), Manfred Mann says, "And the Mini Moog is a brilliant invention - a simple, usable synthesizer. You know people get lovely sounds on others and Stevie Wonder uses this model and Billy Preston uses that, but the Mini Moog is completely different - the possibilities are so simple to realise." Candida Doyle switched between Minimoog, Farfisa Compact Professional II organ, Fender Rhodes, Roland Juno 6, Ensoniq ASR10 and Korg Trident II. In the attached video you can see Stephen playing the Model D at the 6:36 mark. In this Instagram photo posted by Chislett on his Instagram profile, the Moog Minimoog Model D can be seen. 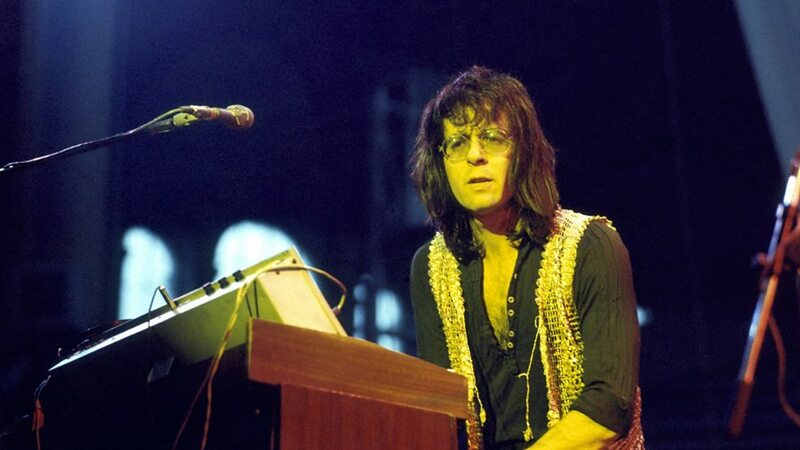 Mark used a Minimoog throughout the early years of Marillion including this Rock am Ring show. > I tend to use it more as another instrument than as a Minimoog. I'm not particularly a specialist in freaky sounds. So I try to find a sound that is suitable for the passage that I want to play. That's just a general attitude have towards synthesizers. It's just one more interesting sound that is still very useful in a musical way, as opposed to in a soloing way. 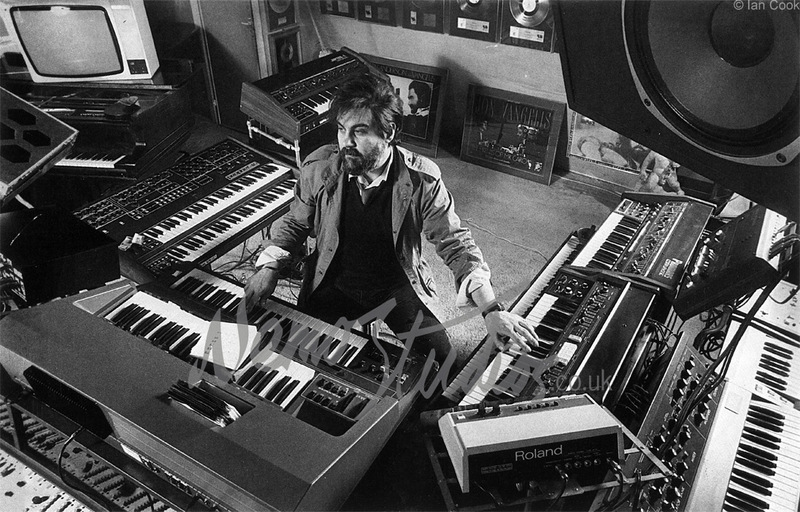 In this image, Vangelis can be seen at Nemo Studios surrounded with studio equipment, including a Moog Minimoog Model D.
Bill mentions his use of a Minimoog in the 70s. "I bought a synth, (a mini-moog,) way back in the '70's, some time prior to writing the 'Drastic Plastic' album, I think. I bought it from a band/duo called 'Hudson-Ford, (an offshoot of 'The Strawbs,') who had not found the synth of much use to them. I immediately took to it and it became a major compositional tool when I created demos for the songs that went onto the 'Drastic Plastic' and 'Sound-On-Sound' albums. It also featured heavily on the 'Quit Dreaming' sessions and far beyond." The Minimoog was Pete Bardens main keyboard for solos during his time with Camel (except on the first album, probably because he didn't have one yet). "the mini-moog aka the "shamputer" by @alichant 's mini-munchkin. i love how young minds work. #album"
Dwayne Goettel (left) in the studio during the recording of Download's album 'Furnace Re:Dux'(specifically the tracks labelled Re:Dux Parts 1-8). One of the three racked keyboards he uses is a Minimoog. "That sequencer was hooked up to a Minimoog that had CV and Gate on it. And with that rig I thee wed! You know, those CV/Gate things were much tighter than MIDI. They were spot bollock on! Spot on. Much better feel than just your normal MIDI rig these days." "My TX rack I used quite a bit. I MIDI'd my MiniMoog and that is fabulous. It really sounds great, and the MIDI on it is really fast. My old Juno 60 is still there, which isn't MIDI'd at the moment but I plan to get it done. The TR808 I used, which is MIDI'd, and a bit of the D50 - there are some good guitar-type sounds in there. I also like the Roland MKS50, which is a rack-mounted analogue synth module. The Korg SG1 piano is very good, and has some excellent sounds, and obviously the Mac. For effects I used the Lexicon 224 digital reverb, AMS, Yamaha SPX90, Klark Teknik reverb, Korg digital delays... the usual things, nothing exotic." Modified with reverse sawtooth for Smart Patrol. > This has been edited from the Schools programme "Science Topics" broadcast in 1983. This episode was title "Electronics In Action" and contains footage of the band performing on the Oxford Road Show in 1982, tinkering with Lament in the studio and Midge demo-ing antique synth! You can clearly see the Minimoog that Ron Mael is playing throughout this video. Can be clearly seen at 1:08 and is located on the top tier of the rack. in this photo we can see his minimoog..
At 0:09, Oliver points out the Model D and says "...we use this a bunch. It's the classic, quintessential mono synth." Stephen O'Malley has got to have a vault of Synths somewhere because the amount of synths he has just keeps growing!!!! Included in Andy McCluskey's equipment list, published in a 1993 issue of* Sound on Sound*. Gary Numan used the Moog Minimoog on all his early albums and live performances. It was a need for unique voice. I knew I wasn’t going to be able to take the piano where I wanted to go. I kept searching for this. I used to run my keyboards through electronic boxes, like a ring modulator, trying to get a unique sound. When I got my hands on a Minimoog, I thought “I know what to do with this!” The sound can remind you of a clarinet, a flute, or a sitar. It’s the fact that it bends and flows. People should have a license to use the pitch wheel! When I first got a Minimoog, the pitch bend was set to be a fourth. Eventually I got it adjusted to where I want it. Some people can get by with pitch bend set to two semitones, but you can not express the creativity that I look for with two semitones. You have to be coordinated, and listen, using your ear like a violinist does. you can see at 8:28 that he uses the Model D.
The MiniMoog Model D can be seen to the right of Jono Ma in thin picture. "I had loads of analogue gear: [Roland Jupiter 8](http://equipboard.com/items/roland-jupiter-8-synthesizer) and [6s](http://equipboard.com/items/roland-jupiter-6), and a Minimoog... " - Liam Howlett. Judging by the date of this interview he was most likely talking about the Model D. "...The item can be seen 1:28 into this video..."
A Minimoog Model D can be seen to Hutter's left in this photo. in this photo posted on his instagram this artist shows us his minimoog! Minimoog Model D on the left. At 4:49 of the video. "...It's really lovely. Signed by Bob Moog...It had been in a cellar for a long time." At 5:11 in the video the Minimoog Model D by Moog can be spotted in Felix Jaehn's studio. > We used a MiniMoog Model D for a lot of the bass synth, which made it super heavy. Free K Dominguez of Kidneythieves seen using a Moog Minimoog Model D in their studio in a picture posted on their official Instagram. Jane is clearly seen with a vintage Minimoog here. Hannes Bieger in his Berlin studio. His name may be unfamiliar to many, but that’s only because he works behind the scenes. Those in the know are well aware that Bieger is an in-demand sound engineer who has mixed down tracks by artists like Steve Bug, Ruede Hagelstein, and Tale Of Us. We peeked over Hannes’ shoulder while he worked in order to learn a bit more about his philosophy and his approach to his trade. MiniMoog pictured in Tim's studio. Tim Green at the top you see a classic keyboards minimoog " I'm just sorry that does not use it . " Live with the Chris Robinson Brotherhood, Adam MacDougall uses a Minimoog for soloing and synth effects. And the massive textured synth on the opening cut,'Plainsong,' was originally created by Smith on his demo. "We worked together on that, but it's mainly Robert," O'Donnell acknowledges. "I played the guide keyboard, with Boris [Williams, drummer] in the studio, because it's difficult to play to a click. For the guide keyboard part, I played a solo violin line. Then I added the bass keyboard line, which was a very heavy MIDIed texture with about four sounds, including a Minimoog, which I was determined to get onto the album somewhere, a very deep cello, and lots of Solina. Robert held down one chord all the way through--a kind of block C thing that he's fond of, with all five fingers very close together. It always works, which constantly amazes me. There's also a single high C held down all the way through, which we brought in and out of the mix." In this video posted by Hultquist, the Moog Minimoog Model D is seen in action. In this photo, provided by [I Heart Synths](http://www.iheartsynths.com/interview-007-kebu/), the Model D of Moog MiniMoog is visible. From the notes on his EP "Parallelism": > Parallelism was made using the following instruments: Minimoog Model D, Roland Juno 60, Custom Modular Synthesizer, and tambourine. RetroSound: Io sono un figlio degli anni '80 e mi piace la musica dei Depeche Mode, The Human League, Talk Talk, Propaganda, The Fixx e altre band da questo momento. Ma, mi piace anche la musica elettronica con chitarre come la band francese, Phoenix. Sun Ra received a Minimoog at the Moog factory in 1970. I know in the Wingspan book, there is a paragraph on page 45, covering the year of 1972, which Sir Paul says of his late wife's musicianship: "The critics would say, 'She's not really playing' or 'Look at her - she's playing with one finger.' But what they didn't know was that she was playing a thing called the Mini-Moog (sic), which could only be played with one finger. It was monophonic. You can use as many fingers as you want but there's only one of them going to work. She rode through all those storms; it didn't really bother her." During his time as keyboardist and producer for the Minneapolis-based art-rock band Chameleon in the mid-1980s, Yanni's massive keyboard rig featured a Minimoog Model D.
Ryuichi played a Minimoog on his "Thousand Knives" album, according to the liner notes. at 0:05 & at different moments of the video, we can see Michael Stein (member of SURVIVE) playing the Minimoog Model D.
This Synth can be seen in this Facebook picture, uploaded by the artist himself. "Lowender" guessing artist means synth is capable of very low bass sounds. Eloy Fritsch use the Minimoog model D in many progressive rock and electronic albuns. 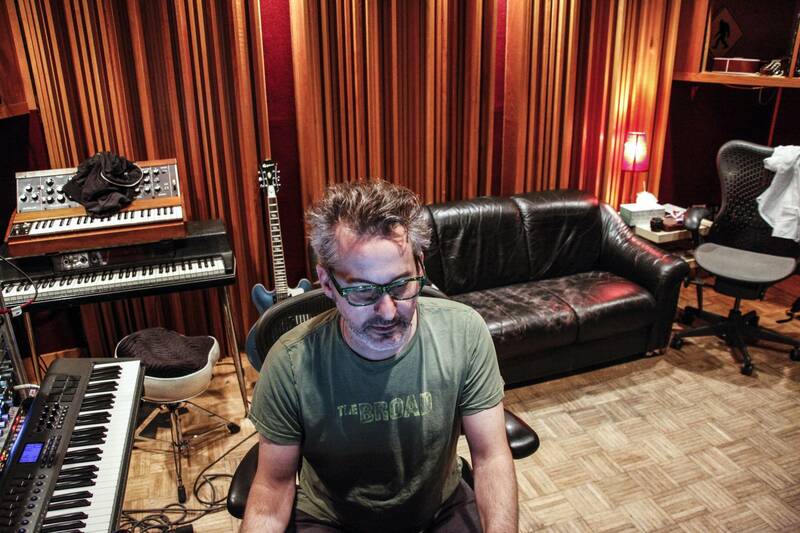 At the picture you can see Marc Romboy's Minimoog Model D Synthesizer. Foster overdubbing a synth bass part on the Minimoog to Michael Buble's "Haven't Met You Yet". As seen in the background of this image. "We did hire a Minimoog at the beginning of this album, but it wasn't MIDI, and we ended up sampling it, and you can hardly hear it. So, there's bits of Moog on Donkey and 808080808, but by the time we reached next album we went Moog mad, 'cause [legendary UK producer] Trevor Horn gave us his Moog by that point." as for POP MASTERS : Simenon has said that in sticking with one instrument, the Minimoog, and making Conboy a full partner, he wanted to simplify Bomb the Bass and its sound, as well as avoid repeating himself. His aims are commendable. After all, he could've cashed in with Clear part two. In this case, though, simpler also means less interesting, and the sad truth is that a repeat would've been more welcome. The solo is from a Minimoog I'm pretty sure. In his studio, record producer Steve Levine has built up a complete digital recording system along with sequencing, synchronisation and MIDI equipment and instruments - though the range of equipment does encompass the odd 'classic' analogue synth such as a Minimoog. In this clip, Gilmour can be seen using a MiniMoog. How does the 300.00 Behringer stack up? It sounds fantastic. It’s not the “same” as a player, sure- but to the audience? They’ll never know the difference. I bought mine just a month or two before the Behringer Model will hit shelves. I could have returned it. I could get what at least seems to be damn close to the sound at a fraction of the cost. I decided not to. Why? I can really put into works what it is to play the Moog. The large sturdy knobs, the satisfying click when you switch waveforms, the excellent keybed, the SOUND. That’s not really enough. The Model D feels, behaves, and is truely a musical instrument. It’s more than the sum of its parts. I’m 100% thrilled that there’s such an affordable way into the magic that is a 3 oscillator Mono synth with a beautifully overdriven fliter. It’s something everyone who loves music & synths should experience. For me a relationship was formed the 1st time I played it. It’s something truely special & more than a collection of electronics as some comparisons might suggest...but that’s just me. Possibly the best synth ever made. There are others technically better, with more options, better design, sound that rivals it. But there's simply nothing as good as an original Minimoog. It blows the reissues out of the water. Bought it in 1995, been using it regularly ever since. A staple. The Rolls Royce of my synth collection. Perfect conditions, sounds gorgeous. I still using it even if it goes out of tune sometimes, but it is very stable. Great wood design. The software version by Arturia is the best emulation. Everyone knows the iconic Minimoog Model D from the 70ies. I own the re-issue version, which is just as great. It's a beast! I own the late version with the stable oscillator board. I wish I had used it as bass machine more often in the past as it has something very pleasant and full in its tone which is hard to get otherwise. It is more flexible than it looks. The filter is the most characterful one ever. One issue though: resonance is breaking down below about 100 Hz which is typical for Moog. If you want bassdrums use layering or take an oscillator controlled by an external envelope. Or just use the feedback trick and get huge bassy persussions. The squarewave of the oscillators sounds better than in the Model15 in my ears although the Model15 actually does it better in almost all other categories. A complete classic and for good reasons too. There are reasons why it's the best known synth, but I can't tell you what they are! It might be easy to dismiss the countless superlatives that have been written and spoken about the Minimoog, but what cannot be ignored is just how many different players used this synth, and how many different styles into which it found itself comfortably fitting. On paper, it seems far too simple: 3 VCOs each with 6 selectable waveforms, and with the option to use the 3rd VCO as an LFO; White and pink noise; Low-pass resonant filter; 2 ENVs (ADS/R - 1 for filter, 1 for amp); external input can be processed through the filter. But when it was played, both the performers and the listeners paid attention! Some say it's that Moog filter, some say it's the oscillator waveforms, others say it was the way Bob Moog overdrove some of the circuitry. But most just say "It's a Minimoog." I have an original Minimoog Model D.
I had it completely refurbished in 2016. It's always been fantastic and is better than ever.